Now here's a version that's a little more in season. 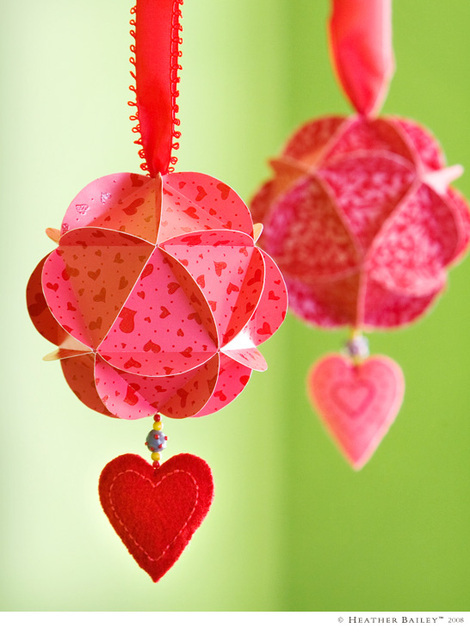 These valentine ornaments are made from my Paper Globes pattern. These go together easily with a glue stick and a good helping of sit-around time. 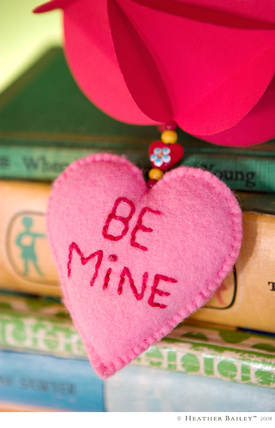 Ornament Tips: For the dangle, string beads from the top of each embroidered heart, locating a large ball-shaped bead at the end of the string of beads. Then insert that large bead into the paper globe before gluing the paper flaps on either side of it shut. Likewise, for the ribbon loop, stitch the bottom of the loop into a ball-shaped wad, then insert that part into the paper globe at a joint before gluing the paper flaps on either side of it shut. When done, the large bead and the wadded up base of the ribbon loop are securely fastened within the paper globe where they don't show. Follow? I probably should do some sketches. We may have been behind on Christmas, but we're looking all set for Valentine's day. That's an notable accomplishment for us. From December 25th through January 26th our family has Christmas (& Christmas Eve), New Year's (& New Year's Eve), our wedding anniversary and both of our kids' birthdays to sort through. We're always a bit cross-eyed this time of year.